The Men’s section is growing from strength to strength and will continue to develop in 2019. We are able to cater for all ages and skill levels and we are eager to strengthen our squad with new players from interstate or overseas, experienced players transferring from other clubs, right through to new players who have never picked up a hockey stick before! 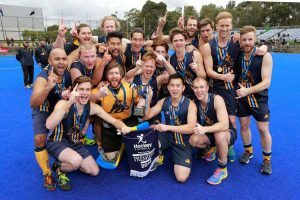 Aside from the hockey, the Mentone Hockey Club strives to achieve a balance between the competitive side of the game and individual, team and club development. As strong supporters of the club’s junior development program the Men’s top 2 sides attend training for the lower grades to help develop skills and match awareness. There is a real emphasis on developing our youngsters and implementing structures to ensure their continued improvement and enjoyment of the sport, as well as easing their transition into senior hockey. The club organises a number of social activities throughout the year across all sections including Cocktail nights, Trivia nights , Presentation Nights and much, much more! We have a tight-knit but very welcoming community, both on and off the pitch. If you want the opportunity to develop your hockey, play at the top level, make great friends and have an awesome time, please contact our Men’s Coordinator, Callen Paulauskas or come down to a training session (times below) and meet us in person.